The LC Engineering 22RE-T turbo header has some great benefits, but could use some refinement. LC Engineering has been making performance products for Toyota 22R-series engines for over 15 years. 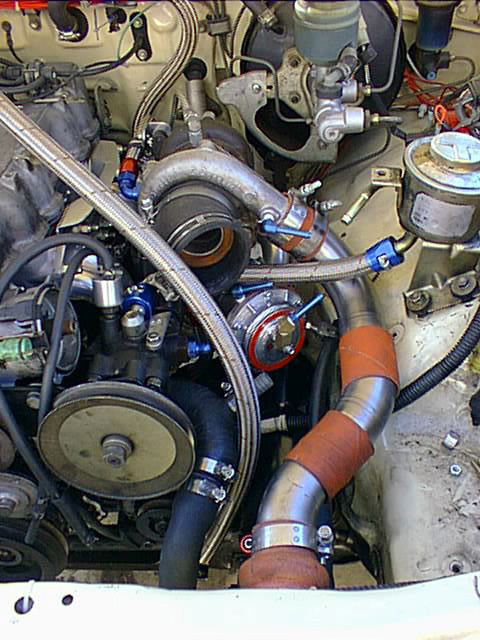 They recently introduced a turbo header and turbo kit to their product line. Since I have long wanted to add a turbo header to my 22RT-E, I decided to purchase and install their turbo header. My test vehicle was a 1986 4x4 truck with a factory 22RT-E (turbocharged) engine. The engine had previously been converted to run a Garrett T3 turbocharger in place of the factory CT20, so this would truly be a test of the efficacy of the turbo header vs. the factory cast exhaust manifold. The LC Turbo Header, Part # 26-150, is designed for the Toyota 2WD and 4WD trucks, 4Runners and Celicas powered by the 20R/22R/22RE/22RT-E engines. It comes flanged for Garrett T3-series turbochargers, which are capable of delivering significantly more performance and response than the stock CT20 turbos that Toyota shipped with the 22R-TE engine. The TIG-welded turbo header features mandrel bent, 14 gauge, stainless steel tube runners and laser cut flanges. The entire header is ceramic coated, a process which increases the life of the header by enabling it to withstand temperatures to 1,500 degrees. The turbo header comes flanged for an external wastegate and includes a 2.5" mandrel bent and TIG welded downpipe. The external wastegate, which is required, is not included in the price of the header. This is not an inexpensive modification, something worth keeping in mind as you read through the following praise and criticism. In evaluating this piece before installation, I can honestly say that there were things I liked about its design and things that I wished had been done differently. On the positive side: the header runners are long and wide, promising even exhaust gas distribution and good flow -- both things you want in a header, and both features that are sorely lacking in the stock "log" style exhaust manifold, which is uneven and restrictive. The header design also incorporates a provision for an external wastegate, which, at 1.5" in diameter, is a HUGE improvement over the stock 1" internal "flapper"-style unit seen on both the CT20 and most other OEM turbochargers. 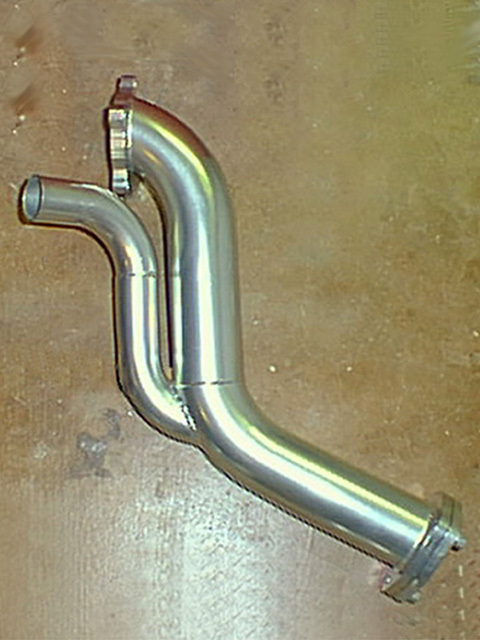 Another truly positive feature is the downpipe (the piece which bolts to the exhaust side of the turbo); at 2.5" in diameter, it is large and very well formed, with gentle mandrel bends, clean welds, and a thick mounting flange that also serves as a block off for the Garrett's internal wastegate port, (a critical detail when converting from an internal to an external wastegate). I would give all of these features very high marks for both design and execution. Unfortunately, there were also a few construction flaws and design decisions that I wish LC Engineering had corrected. Perhaps chief among these was the sloppy welding at the point where the four primary tubes come together, just beneath the turbo mounting flange (in a regular header, this would be termed the collector). Although not externally visible, these welds looked messy, ugly, and potentially fragile, and they were well below the quality I expected when I purchased this header for LC's rather "proud" price. In regular 4-into-1 headers, the collector is one of the critical flow areas, and clean, sanitary welds are key to keeping exhaust gasses moving without adding turbulence. 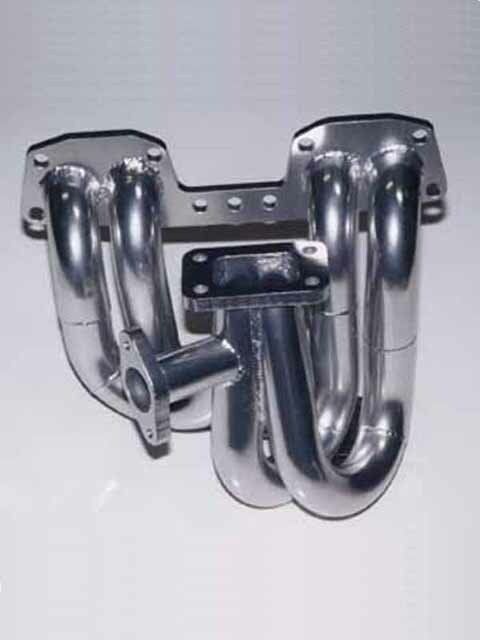 The same characteristics of good flow through the collector should hold true for turbo headers, since the exhaust gasses need to be at maximum velocity to spin the turbo quickly. I've seen a variety of 4-into-1 headers that had very clean and professionally welded collectors over the years, and unfortunately, this was not one of those. Another area I wish had received more attention was the location and mounting of the external wastegate. The external wastegate sits at the end of a "spur" pipe mounted adjacent to the collector, just below the turbo mounting flange. The orientation of it places it (and the pipe it is mounted to) directly above the steering shaft -- within one vertical inch of it, in fact. In vehicles that already have a body lift installed, or where one is anticipated, this might pose some serious clearance problems. As it is, I worry that the sort of knocking about that is common when off-roading will cause the external wastegate flange to contact the steering shaft, which could (conceivably) lead to cracking of the external-wastegate-spur-pipe-to-collector weld joint. Not a happy situation. I have a few other, more minor gripes, but I feel the above are the most serious, and the most worthy of mention. Every header I've ever installed on any vehicle -- and I've installed a bunch over the years -- has always exhibited some quirks of either engineering intent or execution, so these sorts of flaws are not really surprising. What is surprising, or at least disappointing, is that this header costs a BUNDLE. And as necessary and exciting a piece as it is, one gets discouraged to see a unit this expensive fail to live up to its full potential. Speaking of cost, I should point out that there are a lot of little costs involved in installing this piece, from new water lines to new oil lines to (possibly) new power steering and intercooler lines, plus the need to mate your existing exhaust to the new downpipe. And if you don't already own a Garrett turbocharger, well, factor in one of those, too. Even if you already own a Garrett turbocharger, this is an expensive and somewhat involved conversion. Unless you have access to a wide variety of materials and tools, most people will find that this project will take longer than a single weekend to complete, so plan your vehicle's down-time accordingly. That said, the installation of the turbo header itself was fairly straightforward, although the installation affected so many different things under the hood that, taken as a whole, it was far from a minor undertaking. Because this engine had been running a T3 turbocharger (Super 60 trim compressor wheel, .36 A/R turbine housing) prior to the installation of the header, many previous modifications had already been made to ensure that proper air, fuel, ignition, and exhaust events could take place with a minimum of restriction. For example, this engine had already been fitted with a low restriction air filter, larger air flow meter, intercooler, larger (470 cc/min) injectors, blow off valve, ported and polished head, larger 2.5" exhaust, free flow catalytic converter, and MSD ignition. Boost was capped at 15 psi through the stock exhaust manifold, and power was estimated to be 180 hp at the rear wheels. While installation is straightforward, plenty of time should be set aside for the job. To install the turbo header, it was necessary to remove all of the exhaust components from the driver's side of the engine, including the turbo and stock exhaust manifold. The turbo header itself is designed to fit close to the block, and this made it necessary to reconfigure some of the coolant and power steering lines. This was not hard, but it was time consuming, and required some problem solving skills. Another quirk: because LC Engineering designed this header around their existing 22RE exhaust manifold flange plate, 22R-TE owners will need to change out their exhaust manifold studs for the shorter shouldered studs used on the 22RE. (The stock 22R-TE exhaust manifold has a thicker flange plate than that of the 22RE.) Similarly, 22R-TE owners will also need to switch to the 22RE exhaust manifold gasket. Since the header moves the turbo from its stock position below the exhaust manifold to a new position above the exhaust manifold, new oil feed and return lines and new intake and intercooler connections (if the latter is used) are necessary. I'll skip over some of the details here, but I will say that because I've yet to see two identical intercooler installations for these engines, expect that some additional fabrication will be necessary if you run an intercooler. (And you *should* be running an intercooler if you're going to the expense of plumbing one of these headers into your engine!) In my case, I had a very tight knot of pipes, tubes, and hoses near the power steering reservoir, and another tight spot near the power steering pump inlet, which lead to some head scratching and problem solving . In fact, things were so tight near the power steering pump inlet that I found it necessary to rotate the pump inlet fitting 90� counter-clockwise, which required modifying the inlet fitting and notching the power steering pump bracket so the hose end would have sufficient clearance. Some more hose gymnastics were necessary to get the power steering lines running smoothly from pump to steering gear box and from gearbox to power steering cooler. Thankfully, Earl's Hoses makes the appropriate 16 MM X 1.5 MM power steering fitting adapter to handle this type of challenge. Don't be too surprised if you run into similar problems with your various hoses if you decide to undertake this conversion. With the power steering hoses taken care of, I turned my attention to the external wastegate. These come in a couple of pressure ranges. If you are going to use an external boost controller, either manual or electronic, then I would suggest getting an external wastegate with a fairly low pressure rating, as this will give you a wider range of tuning possibilities, allowing you to tune the engine at fairly low boost before cranking things up. For what it's worth, I didn't think of this, and went with the "high" 9 - 13 psi wastegate. The wastegate placement also had its good and bad points. On the positive side, the wastegate adjustment screw, vacuum and boost fittings were easy to reach, and I could get a socket or wrench on each of the bolts. On the negative side, the wastegate "slip" fitting was not a very good fit, and needed to be trimmed by about 1/8" to mesh properly. Now, 1/8" doesn't sound like a big deal, but I could only determine this after considerable pounding and pushing, and the part that needed to be trimmed required still more pounding and pulling to retrieve. The resulting seal is not as tight as I would like, but there doesn't appear to be any reasonable alternative, as the tight space on the driver's side of the engine means that this has to be a two piece connection. The downpipe design is solid, but it did require minor modification in this installation. With the wastegate installed, the only thing left to do was fabricate the short piece of pipe running from the end of the downpipe to the front of the catalytic converter. One nice feature of the downpipe included with the header is the thick, three bolt flange and accompanying unmounted companion flange, which makes fabrication much easier. I found it necessary to dimple the stock downpipe heat shield for sufficient clearance, but this only took a few minutes. Finally, all of the hoses and pipes were in place. I connected the AFM to the turbo inlet with a short piece of tubing, and I was almost ready to start the engine. It's always a good idea to prime the turbo's oil inlet with a little bit of oil (10 - 20 CC's) when it's been sitting stationary for a while, as this guards against cold start damage. With the turbo appropriately primed, I was ready to start it up and take it for a ride. All buttoned down, ready to turn the key, and only needing gasoline! I'll now share one of the more embarrassing moments in my 20+ years of working on my own vehicles: With much trepidation, and after a flurry of mentally reviewing various checklists and bolt sequences, I turned the key and listened with great apprehension as the engine sputtered to life...and then died. That seemed to be it, no amount of cajoling, praying, or swearing would get the engine to fire back up. I began to sweat, and began to frantically retrace my steps in the engine, checking hoses and wires and fluid levels...and then the light bulb went off: Could I be out of gas? After borrowing the wife's car for a quick trip to the gas station with the old gas can, 20 minutes and $2.26 later I had the engine up and running. And running well! I could immediately notice an improvement in the way this header allowed the engine to perform when compared to the stock exhaust manifold: with this header the turbo spooled up very quickly, building full boost some 800 - 1000 rpm below the performance of the stock manifold. It also allowed the turbo to keep generating power all the way up to my conservative 5200 rpm redline. By comparison, the stock manifold seemed to top out at 4500 rpm, probably due to excessive exhaust gas backpressure. And these gains in performance were before tuning the fuel injection to the new power curve! I was very pleased, as these were the sorts of results I had hoped for. 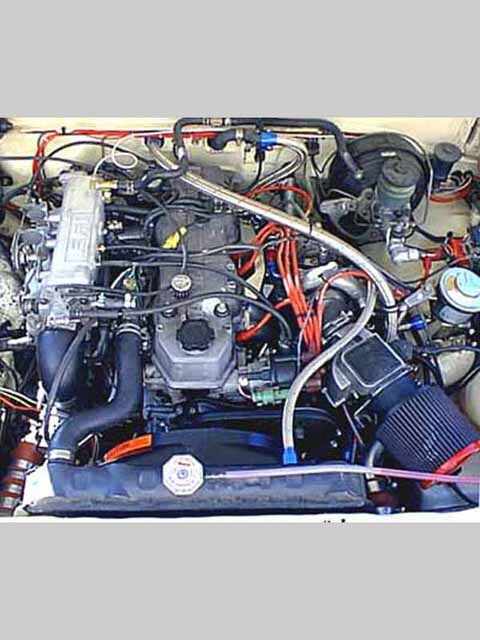 Although it is pricey, I can honestly say that this header is a ready and welcome power builder for anyone who wants to get serious about their 22R-TE, or who wants to think about adding a turbo to their 22RE. While far from a simple bolt on project, the power gains made possible by this header are real and significant. This is not the right piece for everybody, but for anyone with a 22R-TE and a yearning for a much greater dose of power, a turbo header, such as this one made by LC Engineering, is a great addition. But save your pennies, this is not a piece for folks on a tight budget. Toyota 20R/22R series engine performance specialists.